I thought about making a pattern for my Lace Top T-shirt but then I figured it is so easy to make that a tutorial might be better. Basically you are chopping off the upper portion of a shirt and replacing it with a lace piece. Note: I made my original black and gray shirt from scratch but this tutorial shows you how to make one from an existing t-shirt. The blue shirt you see me using in the pics below is an old shirt that I didn’t mind cutting up to show as an example. First put on your shirt and stand in front of a mirror. Using your tailors chalk mark your seam line where you will later attach the t-shirt to the lace. Go from the point where the side seam of the sleeve meets the bodice across to the other side over the top of your bust. Maybe even try a sweet heart design. It is important to do this while wearing the shirt because you can tell where you’re bra sits and if you just draw a straight line from sleeve seam point to the other sleeve seam point you’ll end up drawing directly on top of your ta-tas and that’s no good! You need to fully cover your girls and your bra with t-shirt rather than transparent lace. If the line you drew is sloppy you can take off the shirt and clean it up while flat. On the back side of the shirt draw a straight line across from each sleeve seam line. Now cut along the line you drew on the back. To make sure your front curved line is symetrical fold the shirt down the center front matching seam lines. Pin and cut along the line you drew. Separate the sleeve and neck part from the body. Now you have a t-shirt “tube” and we have to make a new top piece. I made my top in two pieces so that the lace would have a shoulder seam to hold onto. I was worried the lace would stretch out too much if it was all one piece. Using the sleeve and neck part of your cut up t-shirt, turn it inside out and lay it flat. We’ll make front and back pattern pieces based on this so lay the fabric on top of some paper with a cutting mat underneath and trace around with a tracing wheel. Trace a piece for the front and the back. Here is my front piece. The tracing wheel makes tiny dotted marks that you can connect with a pen. I highlighted my pattern lines in green marker. Because we’re not sewing and attaching separate sleeves like the t-shirt has, the sleeve for the lace top will curve down slightly. I made mine cap sleeves so I shortened my sleeve length from my original t-shirt. If you want sleeveless, well, then disregard the sleeves and instead trace the seam line on the t-shirt where the shoulder meets the sleeve. I also widened my neck opening because lace isn’t as stretchy as t-shirt jersey so my big head needs to fit through. You could even try a boat neck or v-neck opening. My altered lines are in pink marker. Make your adjustments to both front and back pattern pieces. Add a 1/4 in seam allowance all the way around both pieces. 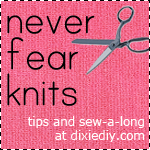 I use 1/4 in because I use a serger. You can add more allowance if you feel the need to. If you don’t use a serger use a straight stitch to sew lace to lace and a zig zag stitch to sew lace to t-shirt material. Cut out your pattern pieces with added allowance and use them to cut out your pieces of lace. Right sides facing pin the lace to the t-shirt “tube” and sew. If you have sleeves you’ll also pin and sew the bottom sleeve edges together as well. Right sides facing sew the pieces together at the shoulder with some stay tape. Finally attach the bias binding to the neck and arm hole openings, stitch in the ditch or top stitch and cover your raw edges up nice and pretty. Now you have a pretty lace top t-shirt! See more finished photos of my shirt at the original post.